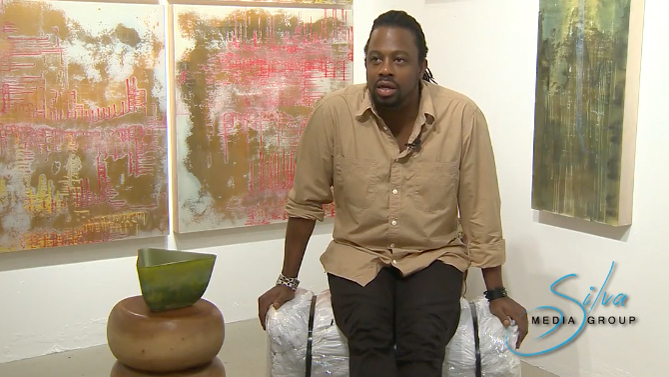 WILLARD ANDRE ALLEN IS A SELF-TAUGHT ARTIST WHO LIVES AND WORKS IN SOUTH BEACH, FLORIDA. HIS PIECES ARE COMPLEX, BOTH IN EXECUTION AND COMPOSITION. PAINTING ON THE “OPPOSITE” SIDE OF CLEAR GLASS, HE WORKS WITH AN INTUITIVE UNDERSTANDING OF SHAPE AND TEXTURE. EACH WORK RESULTS IN A MÉLANGE OF COLOR THAT BOTH INCORPORATE AND REFLECTS LIGHT WHEN TURNED OVER TO ITS RIGHTFUL SIDE.